Your donations can enable her to start walking again and earn for her family. Donate for her surgery now! Saba Ali is a 31 years old female who lives in a small town of Lahore with her parents and 2 school going siblings. Saba completed her education few years back and started working as a lecturer but for last 7 years, she has been experiencing severe pain due to her disease. Saba was diagnosed with Tuberculosis (TB) and got initial treatment from a local hospital but she didn’t get relief from there. Her symptoms worsened with the passage of time and she started feeling severe pain in her hip joint resulting in her disability. 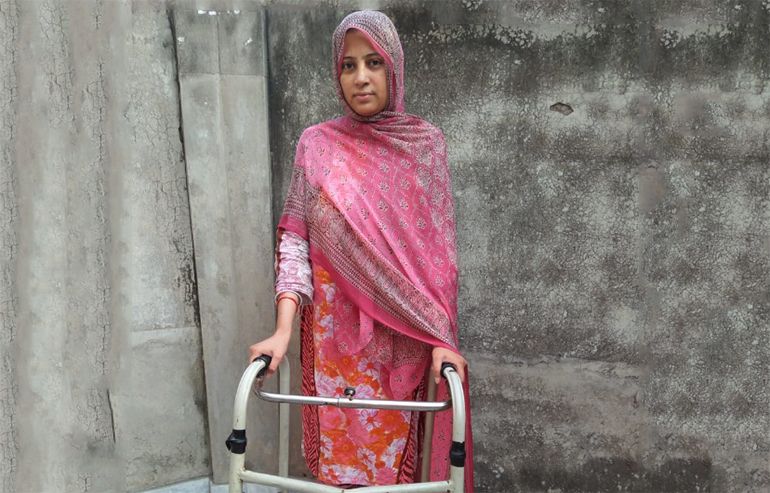 Since 2015, Saba is unable to walk or perform any household chores. She visited many hospitals and finally got relief from TB. Her hip joints have now recovered but she has become disabled due to residual changes in her joints. She feels pain on bending her joints while sitting or standing up. Doctor advised her to undergo hip replacement but she doesn’t have enough money to pay for the surgical expenses. Her father is a retired employee and his only source of income is his pension from which this family hardly makes both ends meet. Saba wants to support her family but she is not even able to perform her daily activities without support. Luckily, she came to know about Transparent Hands through someone and they came here. Saba Ali is scheduled for her Rt. Total Hip Replacement in a few days at Akram Medical Complex. She says, “I’m very happy to hear that I’ll be able to walk after my surgery. Please donate for me so that I can get my health back and start earning for my family”.